作者: The AsiaN Editor on 6 December , 2018. Ahead of Chinese President Xi Jinping’s state visit to Spain, his signed article titled “Joining Hands for New Splendor in the New Era” was published on Nov.27 on Spanish newspaper ABC in two full pages. A day before that, People’s Daily reporters paid a visit to the Spanish newspaper to learn about the stories behind the publication of the signed article on the 115-year-old newspaper. At 4:00 p.m. on Nov. 26 local time, the newspaper director Bieito Rubido Ramonde and the editor-in-chief of the newspaper’s international edition Francisco de Andres were working on the publication of Xi’s article. “We’re greatly honored to publish President Xi’s signed article. It’s a very important work, and is of great significance to the development of friendly relations between the two countries,” said the director. A total of four pages of the Nov. 27 newspaper were about President Xi’s visit, with two pages carrying his signed article, and the other two about related news reports, said a photo editor named Antonio Becenno. It’s rare for ABC to report a state visit by a foreign head of state using that many pages, the editor told People’s Daily, adding that news about China has seen an increase in Spanish media reports in recent years. It’s a great honor for the newspaper to publish President Xi’s signed article, Rubido told People’s Daily, adding that as the Spain-China relations are at its best in history, his newspaper is striving to become a bridge of friendship between the two countries. The newspaper, founded in 1903, is the oldest and largest newspaper in Madrid, and also the second largest in Spain. Rubido told People’s Daily that he followed up the whole process of the publication of President Xi’s article upon being informed of the arrangement. “President Xi’s words are quite impressive with a strong personal style. He has been committed to promoting the contacts between China and the outside world, thus gaining a high international reputation,” said Rubido. 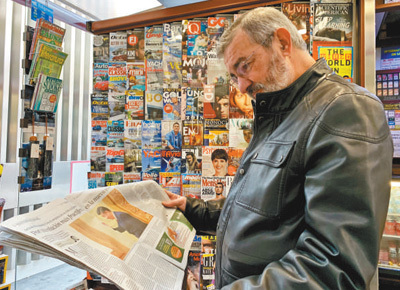 ABC Newspaper has twelve local editions in Spain and two television stations. It is a strategic partner of the National Radio of Spain. Rubido introduced that Xi’s signed article was also published on the twelve local editions, with a total circulation of 500,000 copies. Besides, a will post the article on new media at the same time, attaining a wide readership of tens of millions. During the interview, Rubido invited 7 editors-in-chief of Opinion, Economy, Culture and other sections to join in the in-depth exchanges with People’s Daily, talking about the status quo and future development of media in both countries. Journalists from People’s Daily were also invited to attend ABC’s planning meeting to be held the next morning. All editors-in-chief on site paid close attention to China, especially China’s economic development and the shift of world’s economic focus to Asia. They showed great interests during the discussion, asking a series of questions on China’s peaceful development and opening-up, and expressed hope that in the future, more Spanish readers will know more about China via the reports of the newspaper’s correspondents in China.